Cooperative Education - The Key to Bilingual Success? A New Mexico principal tells the story of an American Indian kindergartner. When shown pictures of four common objects during an assessment of early reading skills, the child described the objects vividly without ever using the names of the objects. That the child was able to do so reflects the powerful oral tradition of his native language, Keres, and his fluency in that language. Coming from an oral tradition means the child is likely to have received less exposure to print than a child whose primary language is oral and print based; this background is an indicator that he might have difficulty learning to read English. The principal wants to ensure this child's reading success, but also wants the student to maintain and preserve the language of the tribe. His dilemma is one shared with educators across the United States who teach an increasingly diverse student population. By the time most children begin school, they are linguistically competent like the New Mexico kindergartner—they have learned to speak at least one language, have developed a large vocabulary, and have mastered most of the syntax of the language. They can usually tell their life story, make requests and demands, and have learned the power of persuasion (as any mother of a three-year-old can attest). However, this does not ensure a child will learn to read English by the third grade. "To read by third grade is a common and great goal," says Susan Paynter, SEDL program associate and reading specialist, "but it requires that teachers meet the diverse needs of all children." Program specialist Sebastian Wren elaborates, "Often there wasn't much concern about children who weren't reading with their peers in first grade, because it was assumed that they would 'catch up' if given time. Research tells us that the children who lack basic skills in kindergarten are the same children who are often two years behind their peers in third grade." Paynter works in SEDL's Reading Coherence Initiative (RCI), a project of SEDL's Program for the Improvement of Teaching and Learning (PITL). The initiative promotes coherent approaches to teaching early literacy in grades K-2 and the prevention of early reading failure. PITL defines "coherence" as a relationship created by a teacher between various parts of the instructional system. Parts of the instructional system include those created externally such as curriculum benchmarks and mandated state assessments. Other parts of the instructional system may be dependent on teacher choices, such as daily lesson sequences and activities. To create coherent practice, the teacher intentionally brings components together with a focus on student learning. "Our goal," explains Paynter, "is to come up with processes and tools that help educators create coherent reading instruction, so that when a child enters school, there is a reasonable guarantee of success at the end." In fact, Paynter observes that although recent research has found a significant relationship between home environment and literacy, instruction can be most important. She says that according to research conducted by Harvard professor Catherine Snow and four colleagues, "Children from low-literate homes need to be in high-literate, positive classrooms for at least three years to encourage development of reading skills." Conversely, a child with good reading skills may end up disliking reading if he or she is in a low-literate classroom environment for two years in a row. SEDL staff members Iliana Alanis, Sebastian Wren, and Susan Paynter are working with six schools in New Mexico and Texas in the pilot program for the Reading Coherence Initiative. Currently Paynter and two SEDL program specialists, Sebastian Wren and Iliana Alan’s, are working on the pilot RCI project at six schools in New Mexico and Texas. Educators at these schools see a disparity in reading achievement among certain populations of students, including students learning English as a second language. The teachers are dedicated to ensuring that all of the students are reading well. "These teachers are sincere and very resourceful-they have tried just about everything," says Paynter, "but they are faced with a challenge to accelerate learning so that students don't fall behind." The initiative integrates four elements for a successful reading program: a conceptual framework, assessment, instruction, and professional development. The teachers receive training on the framework, assessment, and instruction through professional development sessions, study groups, classroom observations, and coaching. The framework SEDL is using in its RCI work (see illustration, below) depicts the knowledge domains that a child must master to successfully learn to read English. The domains and their relationships are derived from cognitive research conducted over the last two decades which have been synthesized into a simple view of reading by Philip Gough and his colleagues at The University of Texas at Austin. At the apex of the framework is reading comprehension-the ability to construct meaning from printed text. Underlying reading comprehension are two equally important elements that research has demonstrated are essential to reading-the ability to understand language and the ability to decode the printed word. Children who have reading difficulties have been shown to have deficits in one or both of these areas. Both language comprehension and decoding are composed of a collection of more fundamental knowledge domains that have been shown to be essential to the successful acquisition of reading, such as having a rich and relevant vocabulary and grasping the alphabetic principle. Cognitive research has made important contributions to early literacy by establishing predictors of success and failure in reading and by reinforcing the need for early intervention for struggling readers. The conceptual framework is presented to teachers and discussed during professional development sessions. The framework is vital no matter what type of reading programs or materials have been adopted by a school. SEDL staff and other specialists help bridge the gap between the theoretical-the cognitive framework-and instructional practices. The professional development components are designed around such framework topics as oral language, decoding, and reading comprehension. Other activities include interpretations and demonstrations of instructional strategies as well as sessions to help teachers interpret student data collected using reading assessment tools and make sound decisions for instructional approaches based on the data they collect. Paynter emphasizes the process isn't a cookie-cutter approach, but equips teachers to respond to each child individually. The professional development sessions actively engage the teachers. For example, during one session to help participants understand the cognitive processes involved in learning to read, the teachers were given foreign language texts, primarily French and German. Some of these texts were storybooks, such as translations of the popular "Spot" books; others were nonfiction. The teachers tried to read the texts together and then were asked how they used cognitive skills to figure out what the story was about. Paynter reports the activity was a great way to get into the cognitive components of reading. It also allowed teachers to experience some of the frustrations their students may face in trying to decode unfamiliar text. Many of the teachers were surprised to learn that it was sometimes easier to decipher the foreign language nonfiction books than the fictional stories. "Nonfiction books are sometimes easier for children to read, too," says Paynter," because they can draw upon their prior knowledge-which is one of the components of language comprehension in the framework-of a concrete subject." In SEDL's developmental efforts, each participating teacher selects two or three struggling readers as "focus students." Throughout the RCI training, the teachers work with these students intensively. They maintain individual literacy profiles for these students and use the profiles to develop individualized lesson plans. The literacy profile is developed through the skill assessment component of RCI that is ongoing throughout the project. "Teachers who are informed about a child's strengths and needs through meaningful assessment of reading skills can better select instruction to move the child ahead," Paynter observes. A formal assessment usually assumes that the child is familiar with test-taking procedures and that a score reflects the child's knowledge more than a child's ability to take tests. Until recently, there has not been a history of testing young children; generally, teachers in K-3 were left on their own to assess beginning readers and teach as they saw fit. Recent research and the legislative push for standards have changed this practice and more early reading assessments are available. Using such early literacy assessment tools requires teacher training in use and interpretation. Wren explains some of the problems associated with assessment tools in the past. "Most traditional assessments are not developmentally appropriate for children at this age," he says. "A formal assessment usually assumes that the child is familiar with test-taking procedures and that a score reflects the child's knowledge more than a child's ability to take tests." Terminology used in the assessment tools can present problems for young learners, too. Paynter reports a recent incident using an assessment to determine a child's rhyming ability. The child knew how to rhyme and recognized words that rhymed but did not understand the term "rhyme." Another problem with assessments for young learners is that very often pictures are used as part of the assessment tool and what is pictured is often a matter of interpretation-one child may call it a ribbon, another child may call it a bow. These examples illustrate why it is so important that assessments be administered in the child's regular classroom environment and why it is important that the child's teacher be the person who administers the assessment-he or she is more aware of what the child actually knows than someone who does not work with the child regularly. Information about each of the child's skills collected through assessments is then compiled in his or her literacy profile. "Using the literacy profile is similar to piecing a quilt," explains Paynter. "Many interacting and developing skills that contribute to early reading success are measured by various tests and tasks. Schools often have some of this information, but it may be collected in a random way. For the literacy profile, key skills are measured and placed in a relationship to other skills. As the pieces are put together, patterns emerge that indicate areas of strength and need for each child." The teacher can compare the profile to SEDL's conceptual framework to determine areas in which instruction should be focused. For instance, the tested skills on one child's profile showed real strength in listening, letter recognition, and oral language, especially rhyming words. On the other hand, the student struggled to understand the boundaries of words, recognize punctuation, and decode very simple words. Noticing the strength of the child's oral language and the ability to create rhyming words, the teacher led the student to produce several rhyming words, then printed them for the student and used these word patterns to teach a common vowel combination that was also in the child's name. The child's ability to decode new words using this spelling pattern was quickly strengthened. "The teacher used the literacy profile to identify the child's immediate needs and also to gather information about strengths which the child possessed. The teacher used the strengths of the child as a starting point for an efficient and memorable way to present new material to the child," Paynter observes. "By using the literacy profile, the teacher was able to see that the child's own language could be a source of rhyming words to teach decoding. This insight created an experience of success for both teacher and student without the frustration of extensive trial and error techniques." The literacy profile also provides teachers with a way to measure results, a step that is often left out of the instruction process. 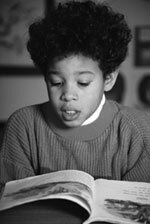 Although a teacher may have used many strategies in teaching reading, he or she may not know which strategy was successful with which children. After incorporating a new strategy into instruction, a teacher can reassess a child's skills, to determine if the strategy was effective with a particular child. The teacher can then decide to move forward in instruction or change instruction to best help a struggling reader. Part of SEDL's professional development is to help the participating teachers design lesson plans to meet the specific needs of the focus students. By working with the focus students, teachers can explore the connection between teaching strategies, demonstration lessons, and student learning. Also as part of the training, through observations, coaching, and an ongoing professional journal, teachers respond to and reflect on the process of teaching reading using new theory, methods, and activities they have learned during the RCI training. A superintendent who has schools participating in the SEDL initiative says that the follow-up observation and coaching have given his teachers the courage to try new strategies. SEDL's work at the sites is still in the early stages, but thus far teachers have also found the profiles and assessments helpful. Several teachers were surprised to learn from the assessments that some of their kindergarten students could not blend sounds together to make a common word. For example, given the separate sounds of /s/ /a/ /t/, some of the children could not blend them into the common word "sat." Several of these teachers planned lessons to strengthen the students' skill in blending sounds using word games provided and demonstrated during the professional development sessions. During another session, teachers used magnetic pieces that represented the different components of the conceptual framework. Each teacher used the pieces to form a hierarchy of the strengths and weaknesses of one of their struggling readers. The teachers compared their hierarchies. Each teacher was able to find other students with problems similar to those of his or her struggling student. Also by comparing the hierarchies, it became apparent that there were areas in which the school needed to examine reading instruction strategies as there were many students with problems in specific areas, suggesting that there may be a mismatch between instruction and student needs in the school's reading program. Lessons like these can do more than map a child's cognitive readiness for reading-they can help inform instruction and a school's reading program. As Paynter emphasizes, "Because reading is a process, how you teach reading is important."